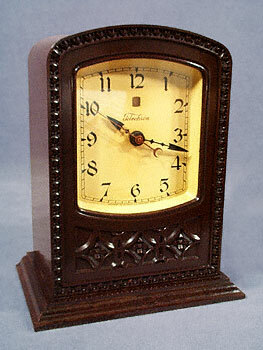 Beautifully crafted of deep chocolate brown bakelite, this magnificent accent clock was manufactured by Warren Telechron Co. around 1925. Known as the 356 Tudor, the front of the 6-5/8" tall, 5-3/8" wide, and 3-3/4" deep case is adorned with an intricate embossed pattern. The matching bakelite back is fitted with knobs for interruption/reset and time set, and a plate which includes Model M-1, and several patent dates, the latest of which is July 14, 1925. A removable two-ended cord plugs into the clock from one end and the wall outlet from the other. This clock works and is in excellent condition.